Buzz Aldrin walked in space on Gemini 12 and explored the moon on Apollo 11, the first lunar landing mission. He was born Jan. 20, 1930, in Montclair, N.J. He received a Bachelor of Science degree from the U. S. Military Academy in 1951, graduating third in his class. He entered the Air Force and earned his pilot wings in 1952. As an F86 fighter pilot in Korea he flew 66 combat missions and destroyed two MIG-15 aircraft. He later served as an aerial gunner instructor at Nellis Air Force Base in Nevada, as aide to the dean of faculty at the Air Force Academy and with an F100 squadron in Germany. He then attended Massachusetts Institute of Technology where he wrote his thesis on “Guidance for Manned Orbital Rendezvous.” Following his Doctor of Science studies, Aldrin was assigned to the Gemini Target Office of the Air Force Systems Command in Los Angeles. Aldrin was selected as an astronaut by NASA in 1963. His concept of space rendezvous that he formulated at MIT was selected and modified for all NASA rendezvous missions. Included was Gemini 12, a four-day mission which Aldrin flew with James A. Lovell starting Nov. 11, 1966. They caught and linked up with an Agena satellite, and Aldrin made a then-record 5.5 hour space walk. Using handholds and foot restraints and resting frequently he was able to do all his tasks rather easily. Without restraints, all previous U.S. space walkers had experienced difficulty and had become exhausted while trying to position themselves in weightlessness. On July 16, 1969, Apollo 11 astronauts Neil Armstrong, Mike Collins, and Aldrin departed for the moon. Four days later, Armstrong and Aldrin landed their Lunar Module on the moon’s Sea of Tranquility. They stepped onto the surface and became the first humans to leave their footprints in the lunar dust. They explored and gathered moon rocks for about two hours. The next day they launched their LM ascent stage and rejoined Collins 60 miles above in the orbiting Command Module, once again using Aldrin’s rendezvous techniques. 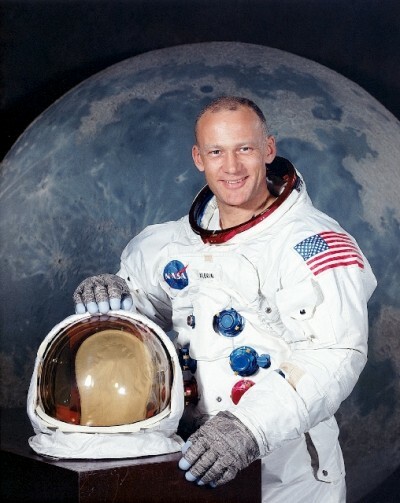 Aldrin returned to active Air Force duty in 1971 and was assigned to Edwards Air Force Base, California as commander of the Test Pilots School. He retired from the Air Force as a colonel in 1972 to enter business. He currently is president of Starcraft Enterprises of Laguna Beach, California and chairman of the Board of Governors of the National Space Society. Buzz Aldrin was inducted into the U.S. Astronaut Hall of Fame on March 19, 1993.